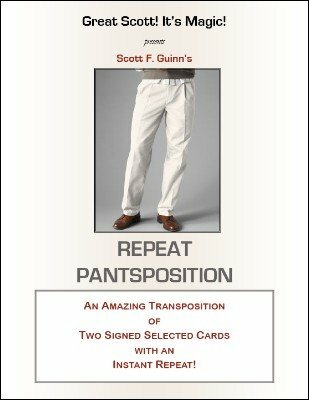 AN AMAZING TRANSPOSITION OF TWO SIGNED SELECTED CARDS WITH AN INSTANT REPEAT! Each of two audience members (our good friends Bob and Sue) select a card and sign its face. Sue’s card (the 3S) is placed on top of the deck, while Bob’s (the KD) is placed in your pants pocket. You put Sue’s card, reversed, in the center of the deck. After a magical gesture, the deck is spread, and... the reversed card at the center is Bob’s signed KD! Remarking that you thought you put Bob’s card in your pocket, you reach into said pocket and remove the card--only to find that it is Sue’s signed 3S! Sue’s card is placed on top of the deck and Bob’s card goes in the middle of the deck. But when you snap your fingers, it is Bob’s card on top of the deck! So Sue’s must be in the middle. However, when you spread the deck face up, Sue’s card is conspicuously absent. Could it be...? You clearly show your hand empty before slowly and fairly reaching into your pocket. You remove one card--Sue’s signed card! Your pocket is empty and you are 100% clean. This is a wonderfully magical and entertaining anytime, anywhere card routine that can be done with virtually any deck. The construction is tight, the moves motivated, and the impact is incredible. Thoroughly explained in this 24-page ebook with 22 accompanying photographs. A strong, professional routine you'll use for the rest of your life! 1st edition 2010; 24 pages.